I’ve been a part of the traditional biology classroom for many years, first as a student and now as a veteran teacher. In such a classroom, students spend considerable time and energy to learn facts and more facts, and then are “tested” on how well they can accurately repeat the concepts. They may develop some understanding of how scientists view the world today, but what they don’t get is the opportunity to learn about the competition of ideas: how science tests and evaluates what we know now to move ever onward toward a better understanding of our world. More importantly, my lessons didn’t emphasize the importance of every student using a scientific mindset to engage with the world. Few of my students enter my classroom with a strong passion to become scientists themselves, but scientific literacy — the ability to think and act critically through a scientific lens — is crucial when it comes to decisions that will impact their daily lives. It is their votes and opinions that will ultimately guide the future of our society. In my classroom, we’ve implemented the EcoRise curriculum, which provides a platform to incorporate key skills such as collaboration, communication, and critique, which I believe are critical for not only in science but also easily translate across other academic disciplines and prepare students for a range of careers that will make a difference. The essential core of this curriculum, which was absent in my previous “traditional” classroom, is that everything we do is connected to real-world challenges. Students learn about the sustainability challenges — including those concerning energy, water, waste, transportation, air quality, food and public spaces — that affect our society and use project-based learning principles to develop their own innovative solutions. We’re teaching them not only to be prepared for the future that will truly exist, which is important enough, but further to be the leaders and changemakers of that rapidly-arriving future society. The process in my school built toward a very real-life application: The student projects were a part of a grant application process, and once student groups developed and refined their projects, they presented them to a group of school leaders and community partners, including the Codman Square Health Center. The following steps were essential parts of the process for preparing students for success. Lesson one in our design process curriculum was performing the “Public Spaces EcoAudit,” which I felt was the most accessible and interesting way for my students to explore the hallways, gardens, and common space rooms of their own school. Looking at these spaces through a new and purposeful lens gets the students’ critical thinking engines running and helps them take ownership of their environment. By assessing the current use, comparing to exemplars from their experience living in Boston, and researching ideas on the internet, the students created their own teams to design and propose ideas on how to improve these spaces. 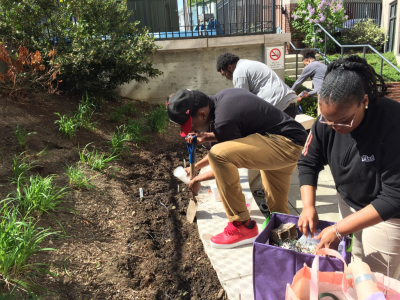 Students planting in the lower level Teaching Garden. The “Fail Forward” Protocol – This is part of the “Create” step and mimics the mechanics of a speed dating protocol, where a student will have the opportunity to pair up with a peer and present her idea. What makes this particularly powerful is that one group of students will be in “presenter” mode and rotate through the stations while the other group stays in place and maintains a “critique” role. Students gained the skills of oral presentation as well as giving and receiving critical feedback. The “Elevator Pitch” – This lesson is part of the final step, “Share,” and features students in their small project groups developing a short 30-45 second pitch, a natural follow-up to the earlier speed dating activity. This is a strong collaborative process within each project group, where every student has already had practice in presenting and refining their group’s ideas in the “Fail Forward” protocol, and then a single member is chosen to perform the elevator pitch in front of the entire class. This activity made the groups focus hard on having a refined and clear message and purpose for their project. 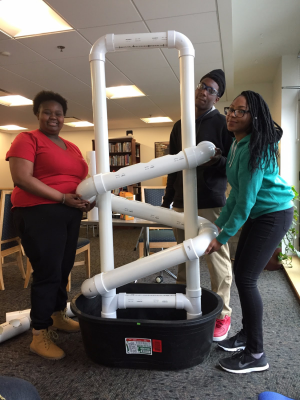 Students dry-fit to monitor the progress in their aquaponics system. In all, this was a tremendous real-world experience for all students, which each group completing a micro-grant application, including generating a detailed budget for the materials and vendors needed to complete their green space projects. While only three groups were ultimately awarded grants totaling $2000 to improve such areas as our patio garden and an aquaponics system, many students from unfunded projects — including those with unique artistic skills such as painting, gardening, and carpentry — were excited by their peers’ work and took the opportunity to join the winning designs. One proposed project to beautify the school hallways with national flags representing the diversity of national heritage of our student body was not funded through the grant project, but their vision inspired a staff member to find outside funding and then collaborated with this group to see it through. Ed Yoo is an 11th Grade Chemistry and 12th Grade Biology Teacher at Codman Academy Public Charter School in Dorchester, MA. 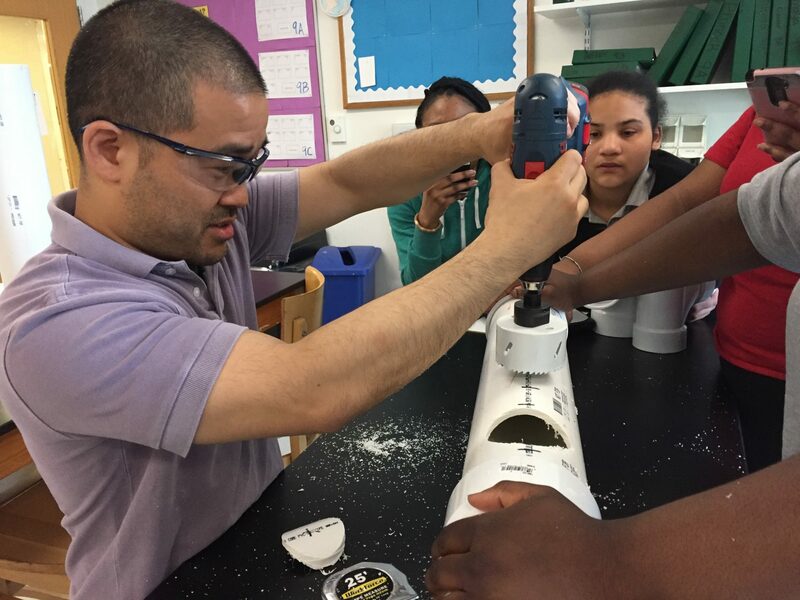 His science classroom uses the STEM curriculum developed by EcoRise. Prior to joining Codman, Ed spent several years studying the biomechanics of terrestrial locomotion at the Concord Field Station, Harvard University. Ed is a graduate of Harvard (B.A. and M.A. in Biology) and the Teacher Education Program – Harvard Graduate School of Education (M.Ed.). 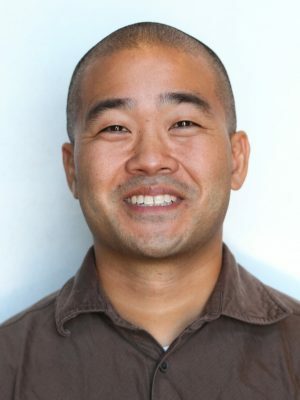 This blog post by EcoRise Teacher Ambassador Ed Yoo was originally published on ASCD’s Inservice blog. 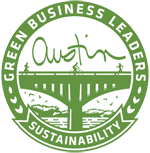 The Public Spaces Eco-Audit is part of EcoRise’s Sustainable Intelligence curriculum. To bring this curriculum to your classroom, click here.